Objectives: It is unknown if uni- or bilateral lung transplant is best for treatment of usual idiopathic pulmonary fibrosis. We reviewed our single-center experience comparing both treatments. Materials and Methods: Between 2002 and 2011, one hundred thirty-eight patients at our institution underwent a lung transplant. Of these, 58 patients presented with idiopathic pulmonary fibrosis (56.9%) and were the focus of this study. Results: Thirty-nine patients received a single lung transplant and 19 patients a bilateral sequential lung transplant. The mean patient age was 54 ± 10 years, and 69% were male. The intraoperative course was uneventful, save for 7 patients who needed extracorporeal membrane oxygenation support. Three patients had respiratory failure before the lung transplant that required mechanical ventilation and was supported by extracorporeal membrane oxygenation. Elevated pulmonary artery pressure > 40 mm Hg was identified as an independent predictor of early mortality by uni- and multivariate analysis (P = .01; OR 9.7). Using a Cox regression analysis, postoperative extracorporeal membrane oxyge-nation therapy (P = .01; OR 10.2) and the need for > 10 red blood cell concentrate during the first 72 hours after lung transplant (P = .01; OR 5.6) were independent predictors of long-term survival. Actuarial survival at 1 and 5 years was 65.6% and 55.3%, with no significant between-group dif-ferences (70.6% and 54.3%). Conclusions: Lung transplant is a safe and curative treatment for idiopathic pulmonary fibrosis. According to our results, unilateral lung transplant for idiopathic pulmonary fibrosis is an alternative to bilateral lung transplant and may affect the allocation process. Although many obstacles to lung transplant remain (eg, shortage of donor lungs, opportunistic infection, or refractory/fatal allograft rejection, and disease recurrence in the donor lung), lung transplant is the ultimate treatment for patients with progressive loss of pulmonary function caused by progressive pulmonary fibrosis. It remains unknown, however, which surgical procedure is superior in outcomes regarding operative performance and early and late mortality. Additionally, organ allocation is discussed. One donor can benefit 2 recipients when an SLTx is performed, and an SLTx allows for a successful transplant when only 1 of 2 donor lungs is acceptable for transplant, or when the recipients have contraindications to lung implantation in 1 hemithorax because of severe pleural or chest wall issues. Additionally, an SLTx can have good functional outcomes and can be performed more rapidly, with fewer perioperative complications than a BLTx. Nevertheless, native lung events (eg, opportunistic infections) may occur in many IPF patients.10 A BLTx can provide superior outcomes, while eliminating the potential for complications (eg, bronchiolitis obliterans syndrome). A BLTx is a more complicated operation, which typically is associated with increased perioperative complications and early mortality. If patients are on the waiting list for a BLTx only, they have an increased risk of dying.11 Thus, there remain substantial controversies in selecting the best treatment of IPF patients. This study sought to compare an SLTx versus a BLTx. Between May 2001 and December 2011, a total of 138 lung transplants were performed at our institution. Of these, 58 consecutive patients (56.9%) with IPF underwent a lung transplant. Thirty-nine patients (67.3%) received an SLTx and 19 patients (32.7%) received a BLTx. After a median sternotomy was done to the pulmonary artery, the ascending aorta and caval veins were encircled. Heparin 300 IU/kg was administered for systemic anticoagulation. The pulmonary artery was cannulated and isolated from the ascending aorta. Ligation of the superior vena cava and clamping of the ascending aorta were performed before the incision of the right and left atrium for venting, while the heart and lungs were flushed with a minimum of 5600 mL antegrade and 1500 mL retrograde Perfadex solution (Vitrolife, Göteborg, Sweden). During the flush, mechanical ventilation was maintained (1.0 FiO2) with moderate ventilatory settings. The lungs were stored in the preservation solution at 4°C and returned to our center. Categorical variables are given as absolute and relative numbers. Continuous variables are given as mean ± standard deviation. After assessing for normal distribution, the t test or the nonparametric Mann-Whitney U test were used for unmatched pairs, whereas nominal variables were compared using the chi-square or Fisher exact test. For measurements within groups over time, we used a 1-way analysis of variance with a Bonferroni correction. To predict hospital mortality, a uni- or multivariate analysis was used. As an independent predictor of long-term survival, we used a Cox proportional hazards regression model. In addition, Kaplan-Meier estimates of long-term survival including a log rank test were performed. P values < .05 (2-sided) indicated statistical significance. The mean age of the entire IPF patient population was 57 ± 7 years for the SLTx group and 50 ± 8 years for the BLTx group (P < .01). Of the SLTx patients, 25.6% were women, and 42.1% of the BLTx patients were women (Table 1). Preoperative patient characteristics and hemodynamic functions are given in Table 1. No significant between-group difference were seen regarding cold ischemic time. There was a significant between-group difference in warm ischemic time regarding support via heart/lung machine and/or an extracorporal membrane and oxygenation system (Table 1). Significantly more red blood cells and fresh frozen plasma units were used in the BLTx group (P < .01) (Table 2). Of the patients who died in the hospital (hospital mortality, 13) only 3 had an acute graft failure. 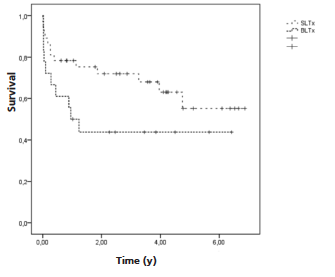 Mean survival after surgery was 34.8 ± 26 months after an SLTx and 21.6 ± 24 months after a BLTx. Overall mean survival was 30 ± 26 months. This resulted in a total of 41 patient years. Follow-up visits were organized in the outpatient department. Follow-up was 100% complete. Mean 30-day survival was 78.4% ± 6.8% for the SLTx group and 73.7% ± 10.1% for the BLTx group (P = .65). Mean 1-year survival was 78.4% ± 6.8% after undergoing an SLTx and 50% ± 11.8% after undergoing a BLTx. Figure 1 shows the Kaplan-Meier survival, which indicate no significant between-group differences for 6 years (55.2 ± 10.7 years [SLTx] vs 43.7 ± 11.9 years [BLTx]). Univariate analyses were performed evaluating 50 preoperative variables on operative mortality. A statistically significant correlation existed between operative mortality and preoperative mean pulmonary pressure (> 40 mm Hg) (P = .02). More than 10 RBCs in the first 72 hours after the operation (P = .024) were detected as independent risk factors. Multivariate analyses showed that preoperative mean pressure (> 40 mm Hg) was an independent risk factor for operative mortality (P = .01; OR 9.7). In our group, no patients had bronchiolitis obliterans syndrome. The Cox proportional hazards regression model showed a statistically significant correlation between midterm survival and postoperative extracorporal membrane oxygenation therapy (P = .01; OR 10.2), and > 10 RBCs during the first 72 hours (P = .01; OR 5.6). There were no statistically significant risk-adjusted correlations for gender, body surface area, hyperlipoproteinemia, arterial hypertension, peripheral vascular disease, diabetes mellitus, preoperative pulmonary hyper-tension, preoperative coronary arterial disease, preoperative gastrointestinal disease, and age > 55 years. Idiopathic pulmonary fibrosis is a chronic lung disease with transition to respiratory failure over time. It has been established that survival of IPF is significantly improved when a lung transplant is performed.8 Historically, an SLTx is performed almost exclusively for all indications. 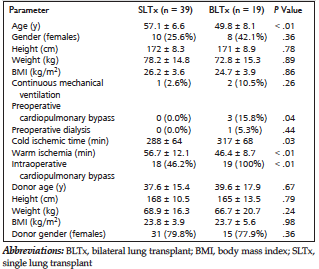 It is usually assumed that the more that the surgical trauma can be reduced, the better the patient outcome will be (especially in already frail IPF patients).15 The benefits of a BLTx seem to be better lung compliance, improved lung volumes, and avoidance of native lung disorders. In our experience, those patients who received a BLTx were significantly younger, had higher pretransplant pulmonary artery pressure, a decreased warm ischemia time, and were required more frequently to receive cardiopulmonary bypass support when compared with SLTx recipients. A large multi-institutional study confirming the use of an SLTx in IPF patients was conducted by Meyer and colleagues.2 The authors used UNOS data and reported 821 patients with pulmonary fibrosis who underwent a lung transplant. They also showed superior short- and long-term survival in patients with pulmonary fibrosis undergoing an SLTx who were aged < 60 years. Similarly, Whelan and colleagues16 identified a BLTx as risk factor for 90-day mortality in IPF patients. Another study by Meyers and associates7 showed no statistically significant differences in short-term survival between a BLTx and an SLTx. A review article by George and associates20 shows that the optimal surgical treatment for patients with IPF is unknown. However, the authors stated clearly that there is a tendency to perform a BLTx rather than an SLTx in IPF patients. Despite inconclusive and conflicting data, current literature show an increase in early mortality after a BLTx, whereas a BLTx improves long-term survival. This discrepancy may be explained by continual improvements in postoperative care and by improved surgical strategies.20 Our study shows no statistically significant differences in short- and midterm survival outcomes for our patients with IPF after undergoing an SLTx or a BLTx. The major limitation of this study is its retrospective nature. In conclusion, there was no significant difference in posttransplant survival outcomes for SLTx compared with BLTx recipients. Outcomes for an SLTx in IPF patients are acceptable. Thus, an SLTx may be valuable in older patients when significant comorbidities are present, whereas a BLTx should be performed in young patients with significant pulmonary hypertension. Unilateral lung transplantation for pulmonary fibrosis. Toronto Lung Transplant Group. N Engl J Med. 1986;314(18):1140-1145. Meyer DM, Edwards LB, Torres F, Jessen ME, Novick RJ. Impact of recipient age and procedure type on survival after lung transplantation for pulmonary fibrosis. Ann Thorac Surg. 2005;79(3):950-957; discussion 957-958. Elicker BM, Golden JA, Ordovas KG, Leard L, Golden TR, Hays SR. Progression of native lung fibrosis in lung transplant recipients with idiopathic pulmonary fibrosis. Respir Med. 2010;104(3):426-433. O'Beirne S, Counihan IP, Keane MP. Interstitial lung disease and lung transplantation. Semin Respir Crit Care Med. 2010;31(2):139-146. Wahidi MM, Ravenel J, Palmer SM, McAdams HP. Progression of idiopathic pulmonary fibrosis in native lungs after single lung transplantation. Chest. 2002;121(6):2072-2076. Sulica R, Teirstein A, Padilla ML. Lung transplantation in interstitial lung disease. Curr Opin Pulm Med. 2001;7(5):314-322. Meyers BF, Lynch JP, Trulock EP, Guthrie T, Cooper JD, Patterson GA. Single versus bilateral lung transplantation for idiopathic pulmonary fibrosis: a ten-year institutional experience. J Thorac Cardiovasc Surg. 2000;120(1):99-107. Thabut G, Christie JD, Ravaud P, et al. Survival after bilateral versus single-lung transplantation for idiopathic pulmonary fibrosis. Ann Intern Med. 2009;151(11):767-774. Christie JD, Edwards LB, Kucheryavaya AY; and International Society of Heart and Lung Transplantation. The Registry of the International Society for Heart and Lung Transplantation: 29th adult lung and heart-lung transplant report-2012. J Heart Lung Transplant. 2012;31(10):1073-1086. King CS, Khandhar S, Burton N, et al. Native lung complications in single-lung transplant recipients and the role of pneumonectomy. J Heart Lung Transplant. 2009;28(8):851-856. Nathan SD, Shlobin OA, Ahmad S, Burton NA, Barnett SD, Edwards E. Comparison of wait times and mortality for idiopathic pulmonary fibrosis patients listed for single or bilateral lung transplantation. J Heart Lung Transplant. 2010;29(10):1165-1171. Christie JD, Carby M, Bag R, Corris P, Hertz M, Weill D; and ISHLT Working Group on Primary Lung Graft Dysfunction. Report of the ISHLT Working Group on Primary Lung Graft Dysfunction part II: definition. A consensus statement of the International Society for Heart and Lung Transplantation. J Heart Lung Transplant. 2005;24(10):1454-1459.
Cooper JD, Billingham M, Egan T, et al. A working formulation for the standardization of nomenclature and for clinical staging of chronic dysfunction in lung allografts. International Society for Heart and Lung Transplantation. J Heart Lung Transplant. 1993;12(5):713-716. Bittner HB, Barten MJ, Binner C, et al. Preoperative introduction and maintenance immunosuppression therapy of oral-only tacrolimus, mycophenolate mofetil and steroids reduce acute rejection episodes after lung transplantation. Eur J Cardiothorac Surg. 2010;38(3):268-276. Weiss ES, Allen JG, Merlo CA, Conte JV, Shah AS. Survival after single versus bilateral lung transplantation for high-risk patients with pulmonary fibrosis. Ann Thorac Surg. 2009;88(5):1616-1625; discussion 1625-1626. Whelan TP, Dunitz JM, Kelly RF, et al. Effect of preoperative pulmonary artery pressure on early survival after lung transplantation for idiopathic pulmonary fibrosis. J Heart Lung Transplant. 2005;24(9):1269-1274. Rinaldi M, Sansone F, Boffini M, et al. Single versus double lung transplantation in pulmonary fibrosis: a debated topic. Transplant Proc. 2008;40(6):2010-2012. Nwakanma LU, Simpkins CE, Williams JA, et al. Impact of bilateral versus single lung transplantation on survival in recipients 60 years of age and older: analysis of United Network for Organ Sharing database. J Thorac Cardiovasc Surg. 2007;133(2):541-547. Hadjiliadis D, Angel LF. Controversies in lung transplantation: are two lungs better than one? Semin Respir Crit Care Med. 2006;27(5):561-566. George TJ, Arnaoutakis GJ, Shah AS. Lung transplant in idiopathic pulmonary fibrosis. Arch Surg. 2011;146(10):1204-1209. From the 1Division of Cardiovascular Surgery, and the 2Division of Cardiology, Heart Center Leipzig of the University of Leipzig, Germany *Sven Lehmann and Madlen Uhlemann contributed equally to this work. The authors have no conflicts of interest to disclose and there was no funding for this study.